At 4,500 square feet and three stories, our beach home offers numerous fun gathering spots and plenty of quiet nooks. When you enter the living room, you'll be awed by the floor-to-ceiling windows overlooking the ocean, and the huge river-rock fireplace. The front of our home, facing the ocean, has a flagstone terrace with Adirondack chairs, plus there’s a glass-protected dining deck with a professional Weber grill, and an ocean-view hot tub. Please Note: We require a 7-night stay during the summertime (June 29-Sept. 2, 2018), and typically have guests check in on Fridays. Our fully equipped kitchen is truly a joy to cook in, with a professional Viking range with 6 burners, 2 ovens and a griddle/grill, All-Clad cookware, baking ware, abundant serving ware and a large sub-zero refrigerator. Between the kitchen and the living room, a dining table (also with a view!) seats 10+. Nearby, the art-filled Lounge is a great chill spot, with a high-end home theater system with a full-wall screen and a full bar, complete with refrigerator, ice-making machine, blenders and plenty of glassware. Plus, the entire house has a Sonos surround-sound system to get the party started. The hot tub deck is just off the Lounge, and beach towels are provided. Our Master Suite, upstairs, is a private enclave that feels like a treehouse, with 280-degree views from the elevated king-size bed, which is surrounded by windows on three sides, placed so you can watch the surf from bed (and the stars at night). The en suite bath has an Asian aesthetic, with beautiful woodwork and raw-edge rock basins, and you won’t miss out on the view while showering in the two-person rock shower. Four of our bedrooms are on the main floor. The Queen Suite (with a ½ bath) has a comfortable reading nook. The Junior King Suite has gorgeous ocean views, a king-size bed and a ¾ bath. The Queen Bedroom, just beyond, is a relaxing retreat. At the end of the hall, the Bunk Room is outfitted with 2 bunk beds, a TV and a Sony gaming system. There's even a "secret hideaway” in the hallway: a full-size futon in a loft accessible up a built-in ladder. On the ground floor, our huge Games Room is outfitted with a mini bar, pool table, games table and seating area with a big-screen TV. Next door to it, our convertible Media Room/Conference Room is a super-comfortable gathering spot with a plush sectional and 75-inch plasma screen, surround-sound home theater and Xbox gaming system. And just steps away, the Library is a quiet getaway ideal for reading a book or working, with a sleeper couch and two computer work stations. The Patio Suite, also on the ground floor, has a king-size bed and a private entrance, with French doors opening to a covered patio surrounded by lush foliage. All our bedrooms are luxuriously appointed, with pillow-top mattresses and hotel-quality linens. There is also a sleep sofa and a crib. The home sleeps 14-15, and has 9 bathrooms and powder rooms. Everything is provided for a comfortable stay, including high-speed Internet; a Nespresso coffee and espresso machine; towels and robes (in the suites); shampoo/conditioner; hairdryers; and a laundry room with two washers and dryers. We stock games and puzzles, as well as beach chairs and beach towels. There is plentiful parking, with room for three cars in the driveway and three more on the street outside our home—plus, there is abundant parking along the street. Brian is a designer/builder who crafts sophisticated, green-built homes that bring the outdoors inside. He has a background in rock 'n' roll touring, and is a wine connoisseur. Leslie is a travel writer and editor. She has written two books, including a Michelin guide to the Pacific Northwest, and writes regularly about the Northwest, as well as Europe and cruising, for a number of magazines. Leslie's passion outside of her work is social dancing. She also loves running and the outdoors, as well as baking. We're both foodies, and love exploring the latest restaurants. We were college sweethearts who re-met 38 years after we graduated from Pacific Lutheran University! We've been together ever since. Brian: I fell in love with Manzanita on my first visit there in 2002, and bought a dated duplex that I completely transformed into our beloved beach home, making it into an airy, art-filled space. Leslie: Our Manzanita home is awesome for gatherings--we've had many family reunions, girlfriend getaways and celebrations of all sorts at our beach house. Both of us are thrilled to know that this home that we love so much is at the center of so many of our guests' most precious memories! This is oceanside living at its best, with the beach just outside the door. Our home has endless ocean views (with the top view from our peak-of-the-house master suite) and play options galore, with a home theater, pool table, hot tub and great gathering spaces. It's easy to make feasts in our fully equipped, high-end kitchen. And our home is only 5 minutes' walk from all the charms of Manzanita. We're also minutes from yet more beaches, hiking trails, a horseback riding facility, fisheries where you can buy fresh crab, and kayak and boat rentals. toilet, shower, This maple and stone bathroom features radiant heating. toilet, This a 1/2 bath, with a bathroom with tub across the hall. toilet, shower, Radiant floor heating adds to the coziness. toilet, combination tub/shower, This full bathroom has two sinks and a tub/shower. toilet, shower, This bathroom is across the hall from the Queen Bedroom. toilet, shower, The 2-person stone shower has exquisite ocean views. toilet, tub, shower, This full bathroom with deep tub is next to the bunk room. outdoor shower, The outdoor shower is situated on the hot tub deck. The King Master Suite bathroom is a private enclave. The Asian-style, two-sink vanity features raw-edge stone sinks and mirrors that reflect the surf. The 2-person shower has some of the best views in the house, with full-length windows on two sides (with privacy frosted glass 3/4 of the windows' length). 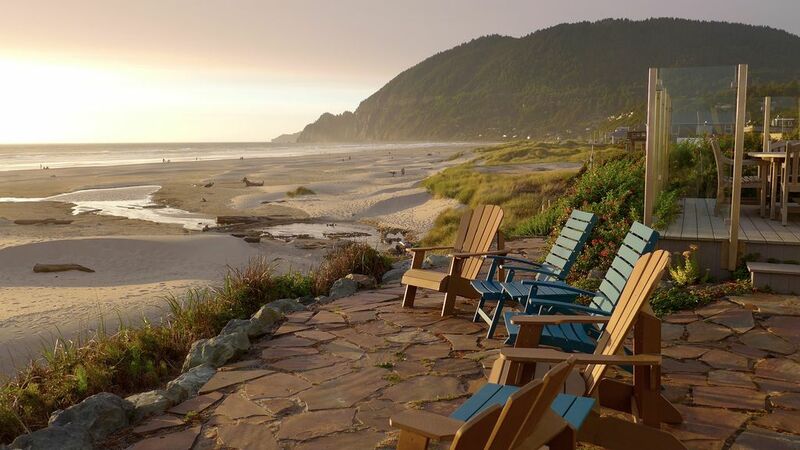 It's only a 5-minute walk to the charming village of Manzanita. The beach and ocean are at your feet. Our home is directly on beautiful Manzanita Beach! You just step down three steps and you're on the sand. We have a lovely view of Neahkahnie Mountain to the north. You can't get any closer to the ocean than our house! Our home sits on a knoll overlooking the beach and ocean. Our home is on the ocean. Hotel-quality linens offer comfort and luxury. The laundry room is equipped with two sets of high-quality washers. There are two sets of dryers in the laundry room. A large river-rock fireplace is a commanding presence in the elegant, view living room. There is dedicated parking for two cars in the driveway, with plentiful space available on the street. The living room, with vaulted ceiling and river-rock fireplace, has spectacular ocean views through floor-to-ceiling windows. It's furnished with a large, semi-circle sectional & easy chairs. Large Sub-Zero in main kitchen, large refrigerator downstairs and a bar refrigerator in the Lounge. A Viking professional range offers 6 burners and a griddle/grill top, plus two ovens. The Viking range has two ovens. We furnish a starter supply of Nespresso capsules (and information for ordering more prior to your trip); olive oil and vinegar; salt and pepper and fresh spices. The kitchen is fully equipped for large gatherings, with All-Clad cookware and an abundance of contemporary dishes and serving bowls/platters. Our fully equipped professional kitchen has a Viking range with 6 burners, 2 ovens and a griddle/grill, All-Clad cookware, baking ware, abundant serving ware and a large sub-zero refrigerator. A table for 10 between the kitchen and living room offers ocean views. The ground floor library is stocked with a small library of books. The massive, ground-floor games room has a pool table, games table with chess, checkers and other games, and a large-screen TV. A selection of kids' games and puzzles are available. There's a whole-house Sonos music system. Off the kitchen, the veranda holds a teak outdoor dining table for 8 and professional grill. The dining deck is shielded from the wind by window walls, offering spectacular views of waves rolling in. Limited accessibility—while the main part of the house is all on one level, wheelchair access is only available by using a path at the south side of the house and then up three stairs off the hot tub deck. The jazucci, on an oceanfront deck, is big enough for 8. We’ve been staying at this house once a year for many years now. The house itself is beautiful and spacious. It’s always immaculate when we arrive and the local contact is always available to help with any questions. We hope to continue to stay there for many more years. Beautiful Location. Good for groups. We greatly enjoyed our stay in Manzanita. The property is beautiful. Excellent views, quirky chic decor in the property, and plenty of room to spread out. The ocean views from the living room and several rooms are outstanding. Everything was in good repair and we felt well-taken care of by the local property manager who was there to greet us and show us around the house. We did a lot of cooking and found the kitchen excellently appointed for the task. The town itself is a little sleepy, but very cute. Local grocery store was amazingly well-stocked, and don't miss Pete and Sister's Pie shop. (Excellent home-made pies.) All in all, it was a great early spring get-away. Amazing place, great amenities and setup, kitchen was stocked well, best location on beach, easy walk to everything in Manzanita, will be back for sure, thanks! We're so glad you enjoyed your stay at our beach house! I enjoy cooking, so I've outfitted the kitchen with anything anyone might possibly need or want to put out lovely meals. It's great to hear our location worked well for you--we're so lucky to be on the beach and so close to downtown. We hope to see you back next year! Beautiful home with spectacular view and great beach access. Have rented several homes over the years and this was the best maintained property. We bring extra kitchenware to make traditional family Christmas dishes. It wasn't necessary this time. The kitchen was stocked better than my home. Having multiple dishwashers was helpful with our crowd. Carmen, the concierge, was very helpful and readily available to us. We had a wonderful holiday and didn't worry about a thing. We were looking for a place to come together as a family. We enjoyed this house because it provided enough space for literally four different branches of our family to have the necessary privacy that they needed. The kitchen is appointed well and the location can't be beat. Beautiful view. Quiet. Quick walk to town. Grocery is close and has everything needed. Management is helpful and quick to respond. Nice house. Plenty of room. We are a return guest and we thoroughly enjoy this house and its location. Perfect for family vacation. Cleaning/prep fee of $300 in addition to rental. Normal one week minimum. Other than July, August and Holidays we may have some flexibility in rates for either non-weekend or extended stays.